The Fellowship was fortunate enough to obtain a copy of CHUM #1 from ComixTribe Comics. The story is by Ryan K Lindsay, with art by Sami Kivela, colors by Mark Dale, and lettering by Nic J Shaw. All local bar owner Summer wants to do is to leave Kingsford Island for a better life. An opportunity presents itself, but things get complicated when her “white knight” Gus mysteriously disappears. It doesn’t help that the law is her future ex-husband Standard, and is totally corrupt. And what part does Penny, the local drug kingpin play in this? This issue is a very strong start to what could be an intriguing story. Lindsay delivers a strong script without falling into the usual stereotypes that are typical for the genre. Can't think of a noir comic with a beach setting instead downtown metropolis. The art team of Kivela, Dale, and Shaw did a great job of balancing the bright, beautiful look of the scenery with the dark, ugliness of the characters and their motivations. Fans of today’s crime stories won’t be disappointed. 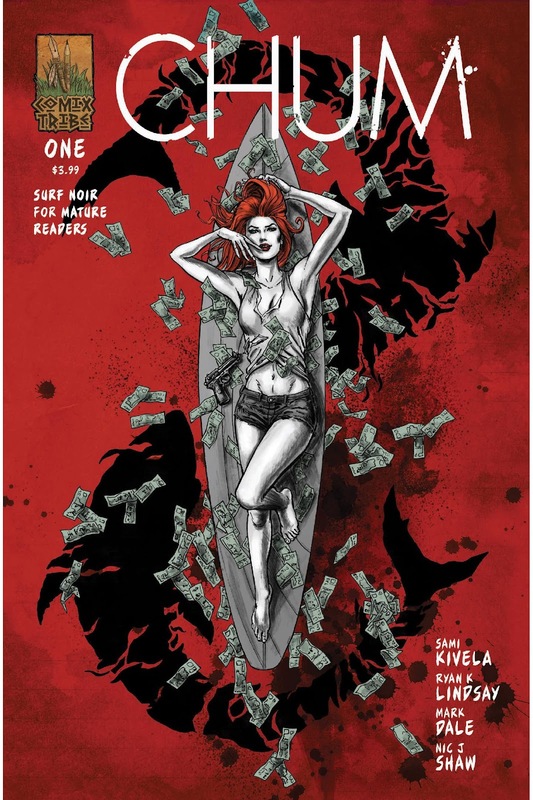 CHUM #1 is in stores now, or available for ordering at www.ComixTribe.com.